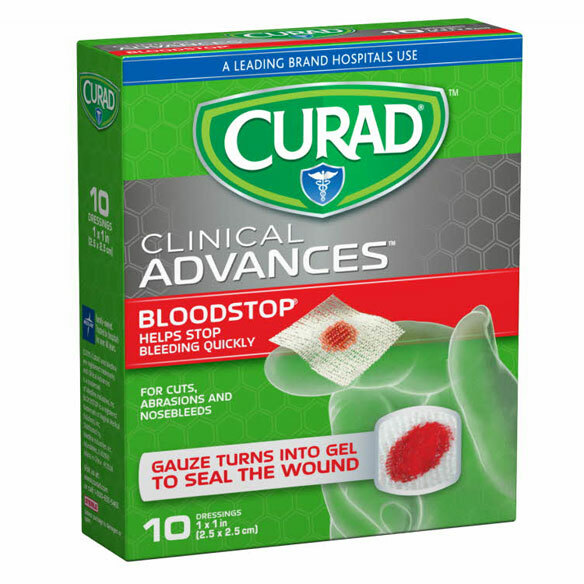 When controlling bleeding is crucial, seal the wound with Curad® Bloodstop® gauze packets. Innovative hemostatic gauze turns into gel to quickly promote clotting and seal the wound within a minute, which is crucial for aging, delicate or sensitive skin and for anyone on blood thinners. Gauze dressing adheres to a wound without discomfort and dissolves in water for easy removal. Use for cuts, abrasions and nose bleeds. Essential care for older, thinning skin. Includes 10 sterile packets, each 1" x 1". I tend to bleed very easily. Curious to see how these work on nosebleeds. same as the above product. First time I've seen these! Think they would be great to have around. They wwork for Moms nosebleeds! Sometimes you need a gauze and not a band-aide to stop bleeding right away. Husband has fragile skin. Other stop bleeding don't work, hopefully this will and have not seen it locally.